Someone had built the causeway. Gods? Men? Who knew? No one remembered when it was built, and no legends had survived to tell. It went forth from the cursed city into the bay and out into the ocean. Men, at times, would journey across to see the other side. Its pillars stood high above the waves and storms. A man might walk along it until he passed from sight of land, and still into the horizon the road reached on. It was a pilgrimage to some, to travel the footpath of the gods. And yet to me, to me who writes, I have no holy intentions. I had heard, and wished to see if true, that the causeway ends. 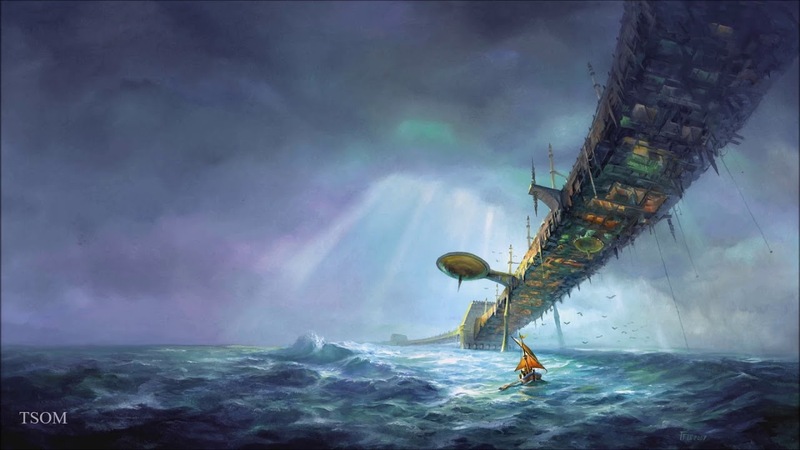 They say it collapses into the sea, that the support pillars failed, were toppled, and the road goes to nowhere but the ocean floor. And if it is so, I shall set my eye upon the horizon, and see if that other tale is true, the one from my dreams, see if out there, on a clear day, one may spy where the causeway continues on, see the other half of the great bridge as a dark speck between heaven and earth. I wonder if in that other world men come and gaze upon a little speck which they imagine to be the part of the causeway here, the part I walk on now. Man! Again! This old/lost city thing! I had an image/idea in my head about this and that’s what my latest post was about and when I finished it I was wondering where did that come from? It really creeped me out, in a good way, if that makes sense. It makes perfect sense. This one was something I remembered from a dream.